When Translating Jokes, Is It Important to Make the Reader Laugh? 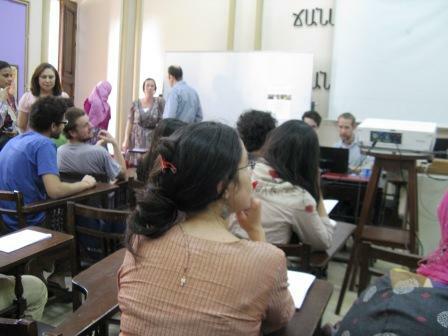 The "Armenian Room" at the AUC Tahrir campus is very small. One could also joke about that. During the discussion portion of the “Al Thawra al Daahika” talk yesterday, translator Humphrey Davies asked presenters: Would you, then, sacrifice any laughter for the reader? The talk was part of the AUC “Translating the Revolution” symposium, hosted by students from a similarly titled class. The humor presentation, ably led by Heba Salem and Kantaro Taira, was also joined by another student. The group seemed to come down particularly hard on the side of maintaining “foreignness” vs. provoking spontaneous laughter. Hence Humphrey’s question. Several of the jokes Salem and Taira used in their presentation highlighted the particular difficulties of Arabic-English translation. One of the “who’s behind Omar Suleiman” jokes, for instance, functioned entirely through a shift from fos7a to 3ameya. Certainly, English has many different registers (one could translate into Shakespearean English, into Black English, into corporate-jargon English) but none of them function quite the same way as TV-broadcasting fos7a and casual-use 3ameya. Even harder to translate were jokes that relied on word play, such as a pawn/police joke that didn’t come off in English at all. Ultimately, the discussion could neither resolve nor get away from the tension between the goals of retaining cultural difference vs. provoking laughter. One imagines the translator’s emphasis depends on audience: If the audience is scholarly, perhaps they wouldn’t laugh in any case. If the audience is popular, well, let them laugh. Our children will not find this funny. 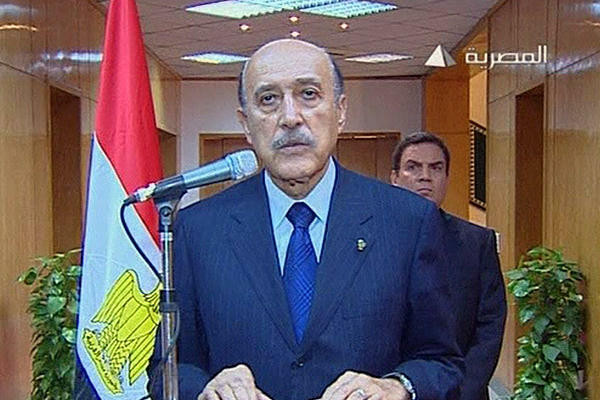 Jokes are also particularly rooted in their moment; in 50 years, it’s doubtful that a roomful of people would crack up just because we’ve been shown the photograph of former VP Omar Suleiman with a man peeping out from behind his shoulder. One of the audience members pointed out that many of Shakespeare’s jokes now require heavy footnoting. Still, even though the presenters spoke at length of the near-impossibility of what they were doing, it was remarkable how many jokes did survive the process of translation. Indeed, some of the jokes they used on the class blog are more likely to be understood by a twenty-year-old in Manhattan than a seventy-year-old in Assiut. A thug during a TV interview: These bastards threw “bluetooth”-cocktails at us! Nothing against the seventy-year-olds in Assiut: I don’t really know what Bluetooth is, either. On Facebook, the groups نكت الثورة Revolution Jokes.